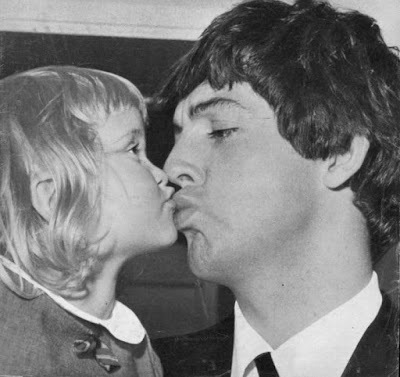 I am sure this little girl grew up and still tells everyone that she got to kiss Paul McCartney! Is that Heather? I have a book that says when Linda started dating Paul, she took a photo of him puckering up and superimposed a photo of Heather doing the same. I found this photo online and it was the cover of a foreign magazine. I cropped out the title of the magazine and turned the photo into black and white because the color was really faded. I have no reason to believe it is a fake. Why would a magazine put a faked photo on the front cover? And regardless if it is a fake or not---I think it is cute. Why would a magazine put a faked photo on the front cover? Why use Magazines Photoshop ?? The pic is real - taken in Holland, June 1964. I have the magazine in question. Went back and checked - the magazine is called Bild Journalen, dated July 1964, and the picture (which is in colour on the front cover) was taken in Copenhagen, not Holland. No photoshopping whatsoever!